Can Gustavo Petro turn Colombia's minorities into a majority? Can Gustavo Petro turn Colombia’s minorities into a majority? Colombia’s leftist candidate Gustavo Petro is receiving support from a wide range of minority groups. But whether the country’s marginalized sectors are able to win the elections is far from certain. Marginalized populations in Pacific and south-east departments, along with rural pockets throughout the country, appear to be binding together in support of anti-corruption candidate Gustavo Petro. The former member of the M-19 rebel group has successfully mobilized minority groups that have traditionally been neglected and discriminated against. Surprisingly, Petro has become the most popular leftist presidential candidate in decades in the traditionally conservative country. Petro’s ability to mobilize marginalized groups across the nation’s black, indigenous and generally discriminated populations has led to him firming as the main challenger to front-runner Ivan Duque, a conservative who is endorsed by hard-line former President Alvaro Uribe. Prominent social leaders have expressed, and in most cases, actively campaigned for the former mayor of Bogota. 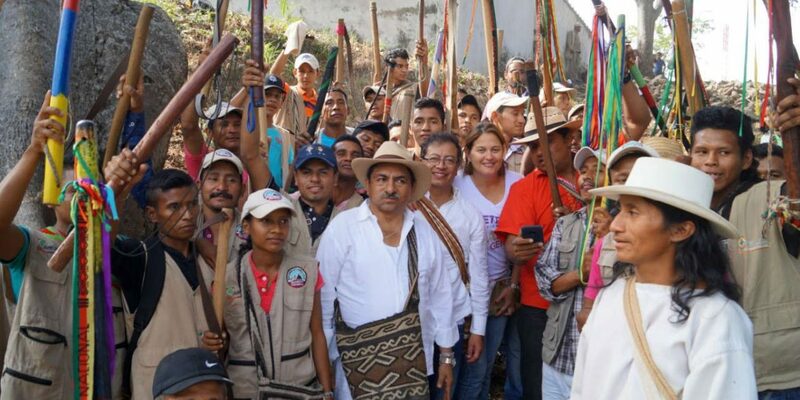 Distinguished indigenous leader Feliciano Valencia has canvassed heavily for Petro in communities across Putumayo, Cauca and Valle del Cauca, claiming Petro is the candidate that has gathered the “ancestral and popular legacy” of the different indigenous peoples. “The more than 200 years of imposition of the the elite is close to coming to an end,” Valencia wrote on his Facebook page. Cesar Pachon, an influential peasant leader out of the central Boyaca province, relayed how Petro is the people’s leader, representing “the poorest and most humble people” of Colombia. “Humane Colombia is a party that was born from social sectors such as the indigenous, peasant and afro-descendant branches of society,” Pachon said alongside Petro in a video. “We will fight for the dignity of a #HumaneColombia… We’re going to change history,” the community leader relayed through social media. The presidential candidate has also committed to fighting for other discriminated groups such as the country’s ever-growing LGBT community, disabled persons and the elderly. Gay rights activist Marcela Sanchez has not endorsed a candidate, but has slammed Petro’s most popular rival. Duque’s campaign has been leading an “organized attack against freedom and pluralism,” the director of Colombia Diversa said on Twitter. If Petro, who has a strong backing in poor areas of the densely-populated capital, as well as good support along the Caribbean coast, can continue to rally these neglected communities, he could emerge as the front-runner. However, whether the minorities can convince the majority of voters is far from certain. All pollsters agree that Duque can count on more votes in both the first and second round of elections.